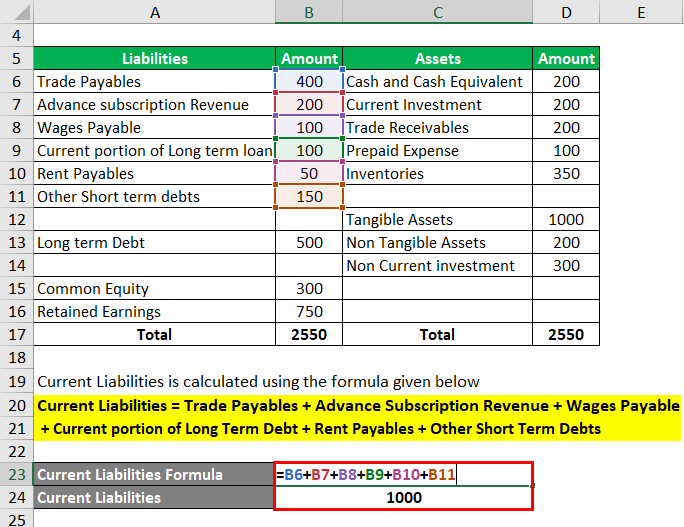 Current Liabilities Formula | How To Calculate Current Liabilities? Current liabilities are the short term financial obligation of a business which is to be settled within a fiscal year or within an operational cycle as defined by the industry within which the particular business operates. 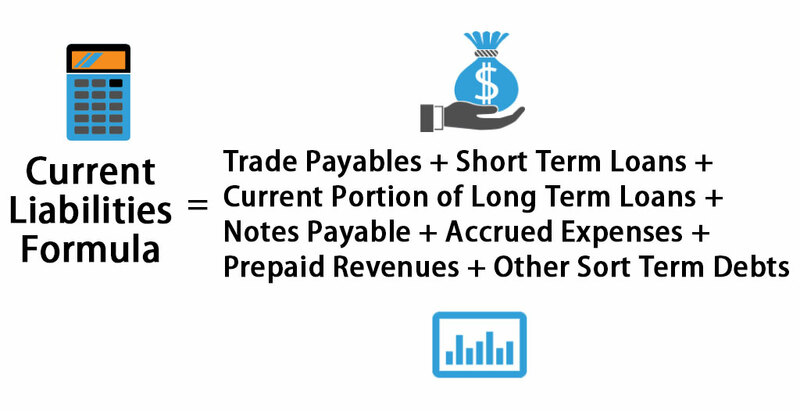 Trade Payables: These are the amount due to the vendors of raw materials and other related suppliers for the business. They generally allow a period of credit for the business to pay them. Short Term Loans: This can take the form of unsecured short term loans or Bank overdraft took from financial institutions, majorly to support the working capital needs of the business. Current Portion of Long Term Loans: This is the portion of Long term debts due in that particular period, this is considered as a current liability. Notes Payable: These are promissory notes the company has received but not yet paid. If these are due within one year then this will be accounted under current liabilities. Accrued Expenses: Accrued expenses are the periodic expenses that are already recognized as an expense but not yet paid. This can be Rent payable, Wages Payable. Once these expenses are paid then this will go out of the liability side of the Balance Sheet. Prepaid Revenues: These are the item against which business has already received cash but hasn’t recognized revenue. For example, business has received an advance cash payment for the next three years of services which they will be providing to a customer. So to the extent of the value of the services that are not yet provided will come under Prepaid expense. Other Short Term Debts: This category Includes all other liabilities that are having short term nature and is not covered in the above categories. 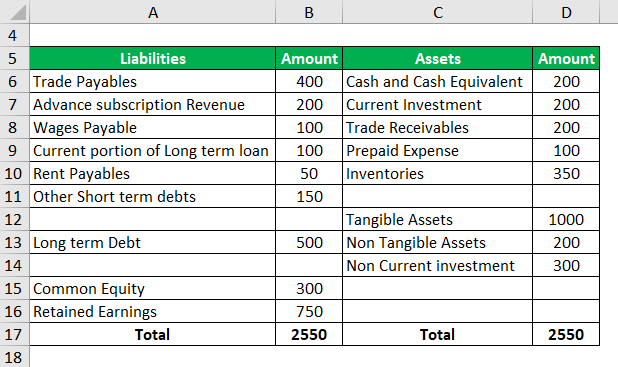 Let’s take an example to understand the calculation of Current Liabilities formula in a better manner. 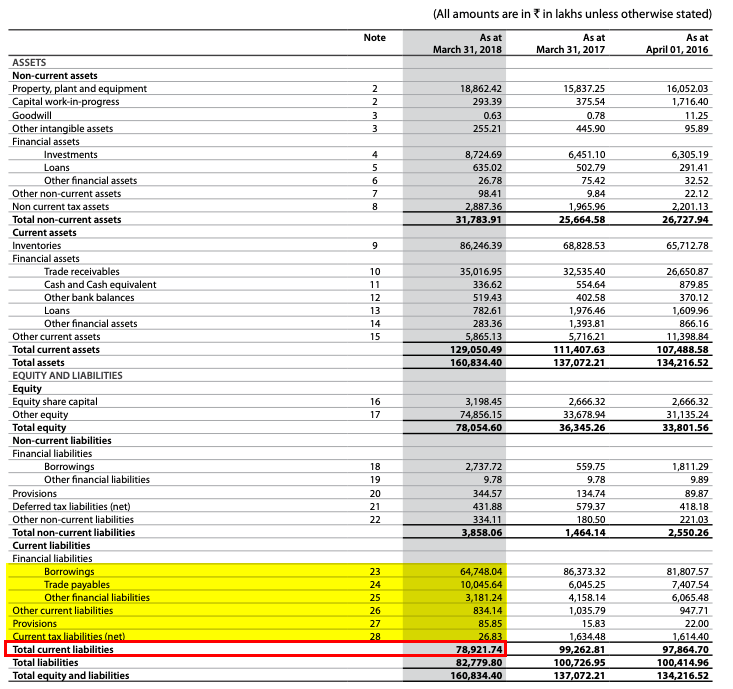 Let’s consider an example to calculate Current Liabilities, assume company XYZ is a weekly Magazine Publishing company. 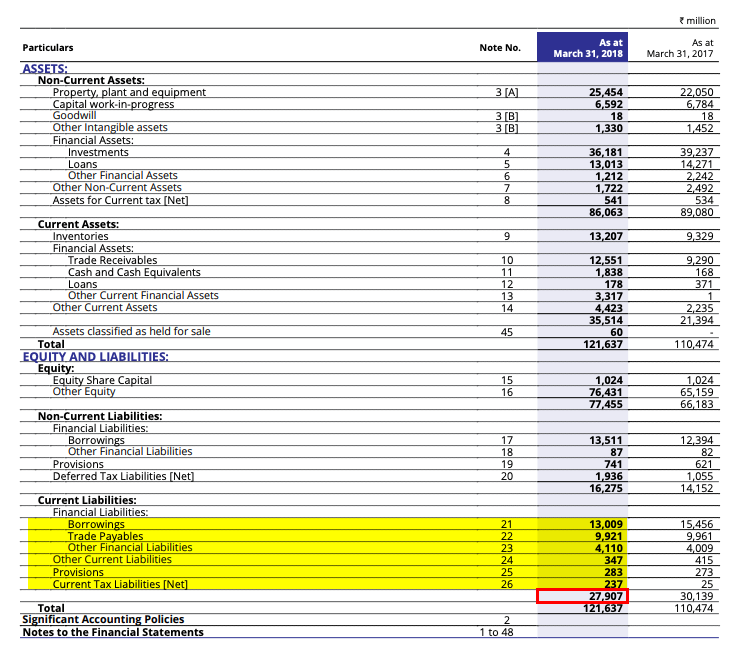 At the end of the financial year, Balance sheet of ABC looks like this. Let’s have look at another example, the company name is LT Foods Ltd. A publically traded stock in NSE and BSE. LT Foods Ltd. is a branded specialty foods company. The Company is engaged in milling, processing, and marketing of branded and non-branded basmati rice, and manufacturing of rice food products in the domestic and overseas market. Let’s have look at another example, the company name is Cadila Health Care Ltd. A publically traded stock in NSE and BSE. It is a research-oriented, technology drive pharmaceutical firm in operates in the space of biotechnology and APIs. Current liabilities are calculated to understand a firm’s liquidity status since current liabilities are the obligations that are to be honored within in a business cycle they are short term in nature. These ratios help to understand whether a company has enough cash and other current assets to pay off its current liabilities. It these ratios are less than one then it indicates a problem (i.e., working capital crunch). To fix this company might have to take long term borrowings, issue fresh stocks or to sell off its long term assets. However high ratio is also not good. It may indicate the company is not allocating its current asset or current liability properly. It is best to follow the current ratio which is perceived to be best by the industry in which a firm operates. If networking capital is less than zero, then it indicates the business should fund this deficit either through a long term borrowing or by issuing new securities to ensure smooth functioning of operation. Current liability has been used by various stakeholders to analyze the liquidity position of the business. A strong current ratio will give enough comfort to lenders because it gives the signal that the company has enough funds to service the loan. Whereas lenders would shy away from lending to a business having a low current ratio. In nutshell, current liabilities are all those financial obligations that a business has to settle/pay in a short period of time, generally within an operating cycle. Current liabilities are calculated to analyze various ratios to identify the liquidity position of a company. How to Calculate Cash Ratio?